This section provides information on what is happening in Canada and around the world in terms of wetland and forest conservation, restoration and other environmental topics. We will be posting regular updates with reports, newspaper articles, and conferences/events that might be of interest. On October 29, 2011, Silverhill Institute joined a broad-based coalition of environmental and economic interests to promote the reversal of the City of Toronto's plastic bag ban, which is set to take effect on January 1st, 2013. 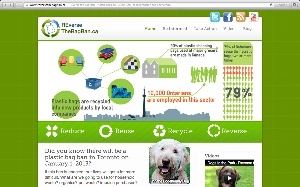 The coalition launched a campaign � ReverseTheBagBan � to inform Torontonians of the facts and the potential impacts of the plastic bag ban. Ewa Modlinska, MES, a research assistant at Silverhill, presented at the media conference the research findings from Silverhill's two plastic bag reports.